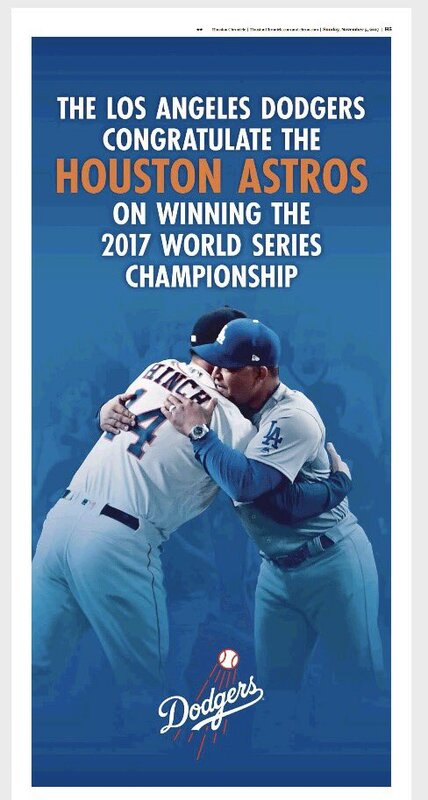 The Dodgers bought a full page ad in the Houston Chronicle's commemorative section of their paper on Sunday to congratulate the Houston Atros on winning the World Series. See the ad on the right. 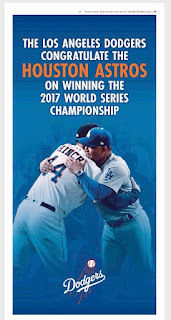 This Day in Dodgers History: I'm really stretching for news here. In 2006 Dodger fan Charles Littleton, a 22-year old Saginaw Valley State University student is TASERed with 50,000 volts by Saginaw (MI) police when he refuses to remove his Dodger cap during a City Council meeting. He is there to receive extra credit for a sociology class. See a news report here. In 2014 the Dodgers officially hire Zaidi Farhan to be their new General Manager. He takes over a position previously held by Ned Colletti. Giovanni Balistreri at When Topps Had Balls shares a fantastic fantasy card of Dodger Cy Young reliever Dr. Mike Marshall using the always popular 1975 Topps Baseball card design. Check it out here. The Dodgers assistant hitting coach is moving on to Boston. Per Mark Polishuk at MLB Trade Rumors; "Red Sox Name Tim Hyers As Hitting Coach." No surprise here. Via Eric Stephen at True Blue LA; "Dodgers decline 2018 option on Andre Ethier." Per Mark Topkin at the Tampa Bay Times; "Longtime head athletic trainer Ron Porterfield leaving Rays for Dodgers." Porterfield will serve as medical director with the Dodgers, working under former Rays baseball operations chief Andrew Friedman, to provide leadership, oversight and direction to their staff while based at the team's Arizona facility. Porterfield said he decided to make the move for several reasons: That he was moving into a newly created position to provide leadership, that it would create opportunity for promotion among the Rays staff and that it would allow him to spend more time with his family on a daily basis, and to be closer to extended family, including his parents, in New Mexico. Per Tyler Conway at the Bleacher Report; "Vin Scully 'Will Never Watch Another NFL Game' Due to Protests During Anthem." "I have only one personal thought, really. And I am so disappointed. I used to love, during the fall and winter, to watch the NFL on Sunday. And it's not that I'm some great patriot. I was in the Navy for a year. Didn't go anywhere. Didn't do anything. But I have overwhelming respect and admiration for anyone who puts on a uniform and goes to war. So the only thing I can do in my little way is not to preach. I will never watch another NFL game." 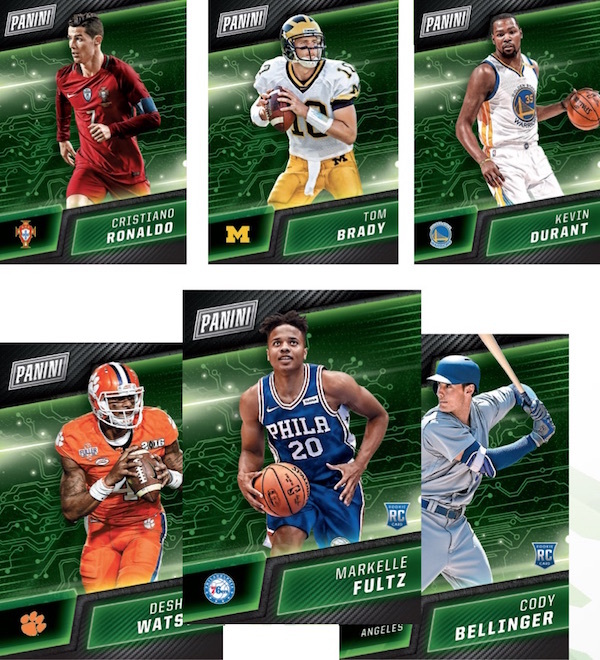 Via Blowout Buzz; "Panini America plans Black Friday and Cyber Monday promo packs." Check out a Cody Bellinger card below. Go here for more information.